Many of them — again, on both sides — also had questions, mostly when they will get to air their views on whether and how the school leadership should recognize efforts to form a teachers’ union. The board gave them little in the way of answers on Saturday morning, but promised not to make a decision before hearing from them in the very near future. Saturday morning’s meeting of the Lusher Charter School governing board was technically called for only two narrow purposes: to hire a lawyer to advise the board on the labor issues, and to go into a closed-door session to hear that lawyer’s advice. At the audience members’ insistence that each of those items requires a vote — and that state law requires the opportunity for the public comment on each of those votes — the meeting took on a broader cast. Attorney Mag Bickford quickly introduced herself to the board as having guided Benjamin Franklin High School through the creation of its teachers’ union. A staff member at the Louisiana Association of Public Charter Schools spoke for Bickford’s experience, and she assured the crowd that she has no personal connection to Lusher other than living close to the campus. When the board prepared to go into its private session with Bickford, however, many of the people in the audience raised their hands for questions. Sue Cohn, herself an attorney, urged the board to share more information with the people who showed up for the meeting, and called it “disheartening” that the board was proceeding so quickly into private discussion. Board member Paul Barron replied that those “procedural” questions are actually “substantive” questions, and said the board needed to get information from its attorney before proceeding with a public question-and-answer session. “That’s not what this meeting is for,” Barron said. Board member Kiki Huston said that some board members had already met twice with teachers to hear their input, and one audience member asked when more of those meetings would be held so other staff members and parents could speak as well. “It’s not for everybody to come speak,” Huston said. Another audience member, Kathy Haab, said she’s had children at Lusher since 1999, and has not yet decided on how she feels about the prospect of a teachers’ union, because she is hearing so much conflicting information depending on who she talks to. She attended the board meeting on Saturday, she said, in hopes of finding more clarity. “How can I get information from both sides?” Haab asked. Board member Chunlin Leonhard said that she is encouraged by the input she’s heard so far, but she wouldn’t feel comfortable convening that kind of meeting until she has some sense of the costs and benefits of the union prospect from their attorney. Board chair Blaine LeCesne said he expects the board will call another meeting within a week. “No decision will be made until that meeting occurs and everyone has their say,” LeCesne said. With that, the board voted to enter the executive session shortly before 11 a.m. 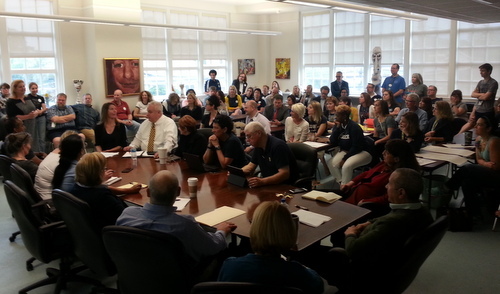 The administrators remained in the session until shortly after 1 p.m., and the board continued meeting for another hour after they left, adjourning shortly after 2 p.m.
LeCesne said afterward that no date has been decided upon for the next meeting, and that there is no timeline for a decision on the issue. Why on earth would parents think they have a say in whether or not the teachers unionize?